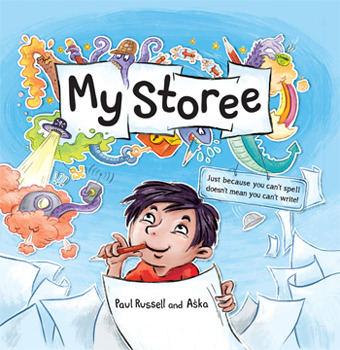 Paul Russell is a children's book author and a primary school teacher. He also has dyslexia. In My Storee a young boy has a mind full of wonderful stories but when he writes them down, day after day, they come back covered in red pen after his teachers have corrected his spelling. It seems his dyslexia will always hold him back from sharing his creativity the way he longs to. Then a new teacher arrives at the school. Mr Watson tells magical stories and draws wonderful pictures. He makes his students feel safe. He inspires them to be themselves. He doesn't cover the boy's stories in red pen " and with this newfound acceptance the boy finally feels comfortable to just write! 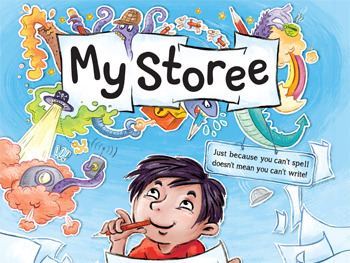 My Storee is a story of hope and acceptance into a world of literature that can too often seem impossible or difficult for dyslexic children to enter because of the rules that surround it. It highlights the magic and importance of -story', the ideas and the creativity behind literature that are too often taught out of children through an over-emphasis on teaching them rules, structure and spelling. It is an engaging and creatively designed picture book that provides inspiration and support for reluctant writers and dyslexics, and shows the importance and power of good teachers. It is also the story of Paul Russell, the author, who as a dyslexic boy was inspired to become the writer and teacher he is today because of one teacher who believed in him. Paul Russell is a teacher, artist, playwright, author and father of two. This, his second picture book, is inspired by his own experience with dyslexia. Is first book, Grandma Forgets, was a CBCA Notable book for 2017. Aśka is an award-winning illustrator, artist and scientist, who has lived all over the world but now calls Australia home. To illustrate My Storee Aśka worked with around 70 children, almost half of whom were dyslexic or had reading difficulties. These children helped her to develop the imaginary world in the book through the stories they created and their ideas were incorporated into the backgrounds of the book illustrations.